Nowadays kung fu is a term that describes the martial arts from China, but the actual meaning of the term “kung fu” is a skill acquired through great effort that has merit attached to it. Many people can be kung fu at many things. Someone that excels in dance can be kung fu at dance. An exceptional chef is kung fu at cooking. The term was used to describe someone that has reached a level that many have not. Therefore, in the old days if someone was exceptional at tiger style, they would say he is kung fu at tiger style. The proper term for the Chinese martial arts would be wushu which literally means martial methods. But as the Chinese martial arts grew and became more popular as well as the birth of the Chinese performance martial arts, which were also referred to as wushu, the term kung fu evolved. Today, especially here in the United States, the term kung fu is used to describe the traditional Chinese martial arts while the term wushu is used to describe the Chinese performance martial arts. Although there may be a few old masters that refer to the traditional Chinese martial arts as wushu, most have adapted to the term kung fu for the traditional Chinese martial arts. 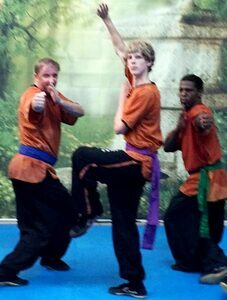 Today, if someone is kung fu at tiger style, they would simply be referred to as being a master of tiger style kung fu. As a student you have come to realize that kung fu comes through hard work, consistency and dedication. It is not just learning, remembering and doing the moves but instead striving to perfect the moves to the best of your ability. Making the moves feel natural and creating them into natural habits of movements. If needed for self defense the move will come out instinctually, as a result of all your hard training. This training not only makes you healthier but also builds the strength inside you that is needed to make the actual move effective.